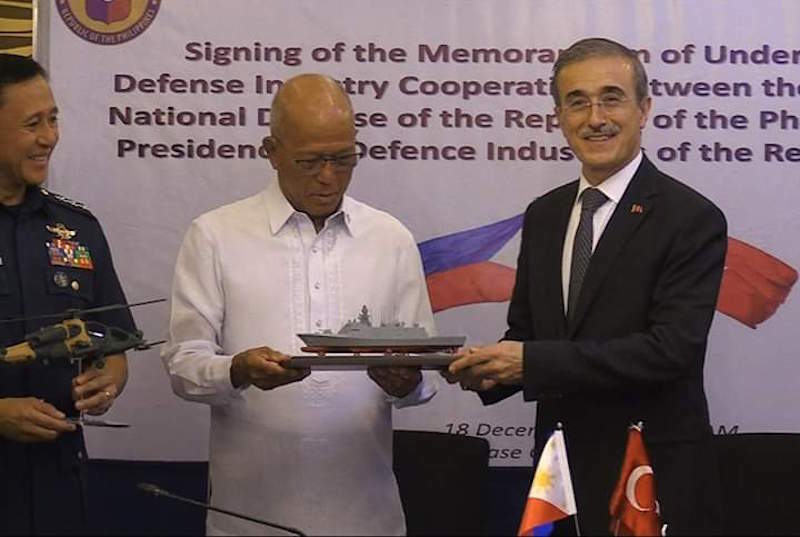 MANILA --- The Department of National Defense (DND) and the Presidency of Defense Industries (SSB) of the Republic of Turkey signed a memorandum of understanding (MOU) on defense cooperation on Tuesday. The signing took place at Philippine Air Force headquarters in Villamor Air Base, Pasay City, DND spokesperson Arsenio Andolong said in a message to reporters. The MOU was signed by DND Secretary Delfin Lorenzana for the Philippines and President of Defense Industries of Turkey, Prof. Dr. Ismail Demir. The MOU will focus on government-to-government acquisition, as well as the development, production, co-production, and transfer of defense technology between the DND and the SSB. ISTANBUL --- Turkey and the Philippines signed a memorandum of understanding for defense cooperation in the Philippine capital Manilla on Tuesday. The deal was signed by Ismail Demir, the head of Turkey's Defense Industries Presidency (SSB), and Delfin Lorenzana, the Defense Secretary of the Philippines. Currently selling guns, ammo and night-vision glasses to the Philippines, Turkey now has its indigenous ATAK battle helicopter, unmanned aircraft and vessels on its agenda to sell to the Philippines, Demir told Anadolu Agency. "Cooperation in technology and local talent development are key to the bilateral relations with the Philippines," Demir said. The Philippine Air Force was planning to purchase 24 attack helicopters within the scope of the Attack Helicopter Acquisition Project, but reduced the number to eight to 10 due to budgetary concerns. Turkey previously inked an agreement with Pakistan for the sale of 30 ATAK helicopters. Designed in accordance with the challenging climate and geography conditions, the T129 ATAK is used in the inventory of the Turkish Armed Forces and the Ministry of the Interior with the new generation mission and weapons systems and the highest performance and maneuverability features in its class. ATAK is one of the most important players in the competition in global markets with its features.